Victoria, Mahe (Seychelles) – April 2, 2019 (travelindex.com) – This issue of our Weekly Tourism Report is being issued as I leave Seychelles for Seville in Spain to participate in this year’s WTTC Summit where US former President Barack Obama will be delivering the Key Note Address. WTTC remains the biggest grouping of the tourism industry’s private sector trade and they continue to guide the way forward for a healthier tourism industry. I am this year a delegate in my private capacity as Saint Ange Tourism consultancy and look to working closely with WTTC’s President CEO Gloria Guevara Manzo. Seychelles has seen a lot during this last week starting with President Danny Faure making an Official visit to Saudi Arabia accompanied by a top ranking delegation. This visit was announced by State House as well as by all Media Houses in Seychelles. The drive for increased visibility by Seychelles has seen a positive move in collaboration with Air Seychelles, Ethiopian Airlines and Kenya Airways. The six person group coming from Uganda, Ghana, South Africa and Kenya arrived in Seychelles on Sunday for a few days of discovery of the island’s latest tourism developments. This initiative is a good one because Seychelles, like any other tourism dependant country needs visibility if it is to remain relevant in the world of tourism. This team coming from Africa can only help Seychelles because it is common knowledge that for African destinations the biggest growth potential is from the African Continent itself and the more Africa knows of the Seychelles, the more the islands can benefit from tourism potential from this continent. Three airlines of the region:- Air Seychelles, Ethiopian Airlines and Kenya Airways keeps the islands . Most of the six members of this visiting press group are friends of Seychelles, and they have been known for years to many of us. Let us ensure they all appreciate what we have as key USPs, and what we are doing to consolidate our tourism industry. For six consecutive years Seychelles staged the “Carnaval International de Victoria”, a carnival for the world of carnivals aptly called the Carnival of Carnavals. This event stated in 2011 and managed in the short space of time to be listed amongst the best carnivals because it was different as it attracted all the best and most popular carnivals of the world to parade together in Victoria, the World’s Smallest Capital. Friends like Dr Claire Holder, the Chief Executive of the Notting Hill Carnival of the UK was always on our side and introduced initially to our carnival project by the British High Commission. Dr Rolf Herpens of the Dusseldorf Carnival of Germany as well as Danniel Okamoto the head of the Brazilian Carnival Team were also supportive as well as Nico Barito who managed year after year to get the Indonesian Carnival on board and MTPA of Mauritius who came out to show the ability of islanders in carnival mode. Support for this unique event was received from everywhere and President Didier Robert of Reunion was the sincere partner we could always count on. A co-host they showcased their island to an audience and press as if they were at a tourism trade fair. Africa, the Vanilla Islands, Europe, Asia, Australasia, the USA all flew their flags in a event that is still making positive news today in the four corners of the world. The Managing Editor and CEO of VoyagesAfriq Media Limited Mr. Kojo Bentum-Williams has been appointed as the UN World Tourism Organization‘s Senior Expert for Communications in Africa. This appointment will see him lead communications of the Organization’s activities and events in Africa. 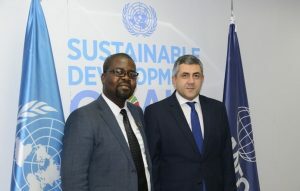 This new appointment took effect in March 2019 and part of his core mandates is to grow the UNWTO’s ten points agenda in Africa under the Zurab Pololikashvili led administration. He is also expected to coordinate with the Africa Department at UNWTO to reach out to members of the African media and hold clinics to further train and inform travel media on the continent. Kojo is the founder and managing editor of VoyagesAfriq Media Limited, a pan African travel media company which publishes VoyagesAfriq Travel Magazine Quartely and operates the online portal VoyagesAfriq.com. He previously worked as the press secretary to Ghana’s former ministry of Tourism Culture and Creative Arts until 2014 and also worked a press officer at the Ghana Tourism Authority. He has covered a wide range of global travel and tourism conferences and he is seen by many as one of the authorities in the affairs of the UN Tourism Agency. ATCNews and Saint Ange Tourism Report wishes Kojo the very best in his new appointment, a strategic move by the powers that be in Madrid to deepen the UN agency’s engagement with the African continent and vastly improve and advance their agenda for and communications with Africa. Destination Seychelles sited as ‘The Most Beautiful Island’ in the world after walking away with the title at the GQ Travel Award, a ceremony that took place on March 15, 2019, at the Metropol Hotel, in Moscow Russia. The GQ Travel Awards Ceremony recognizes the leading companies, hotels and destinations from the elite travel industry. The winners in the 17 different categories including Seychelles were chosen by GQ readers who voted online on the magazine’s website. The Island destination was presented with the award during a ceremony attended by some 250 prominent guests including industry professionals, representatives of host countries, Russian celebrities and famous travelers, and was followed by a gala-dinner. Ms. Diana Sarkisyan, PR & Marketing representative from the Seychelles Tourism Board (STB) for the Russian and CIS region, accepted the award on behalf of Seychelles. Seychelles remains a high-end destination, popular amongst the Russian visitors for its sandy white beaches, warm turquoise waters and diverse unique flora and fauna. Various beaches such as Anse Lazio on Praslin have been seen as being among some of the most beautiful in the world. The island nation is one of the world’s leading actors when it comes to sustainable tourism and sustainable development, a concept to which the Russian visitors are very responsive. Speaking about the latest recognition received by the destination at the GQ Travel Award, Mrs. Sherin Francis STB Chief Executive mentioned that it is an honour for the destination to have been voted by the readers of the GQ magazine. “It is such a privilege to feature as the most beautiful island, as a destination, we are conscious of our inestimable resources and we strive to demarcate ourselves by our uniqueness and it is rewarding to see that our efforts have not gone unnoticed, “said Mrs. Francis. The STB Chief Executive further stated that the achievement is the result of hard work and congratulated the various partners for their constant support towards building the destination’s reputation. GQ is a men’s magazine offering analytics and current reports of international quality with latest men’s fashion and style news. It is the number one magazine for male visitors of luxury department stores. GQ’s regular authors are the best of the best in their industry, from both Russia and abroad, and has a close access to celebrities unlike any other Russian magazine in its niche. It is an unrivalled guidance and companion for a successful man. Copyright © 2019 Visit Afghanistan. All rights reserved.